This Spring, our club has made several donations to local organizations in an effort to support good things that are happening in our community. “We’re All In!” is a buying group organized by people who are actively involved in promoting the educational experiences gained by youth when raising livestock. Donations are used to purchase livestock from local youth at the Comal County Junior Live Stock Show to ensure all kids have a buyer. Project Graduation uses the money to sponsor non-alcoholic parties after graduation ceremonies. April 4, 2018 – Lucy Gale, Development Coordinator for Comal County Habit for Humanity was the guest speaker at the club’s April 4 general meeting. 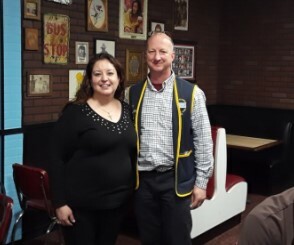 Habitat for Humanity was presented a check for $2000 from our club which will be used to purchase trusses for a home currently under construction. Comal County Habitat for Humanity has built homes for 44 families over the past 25 years. 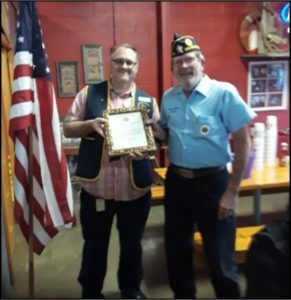 At our March 21 general meeting, incoming Club President Ted Fero received a certificate of appreciation from John Schendel (right) of American Legion Post 179 in recognition of our club’s support of the Boys and Girls State programs. This year we are sponsoring two boys for Texas Boys State ($295 each) and two girls for Bluebonnet Girls State ($425 each). John’s wife Sandi who is president of the American Legion Auxiliary also attended for the presentations.